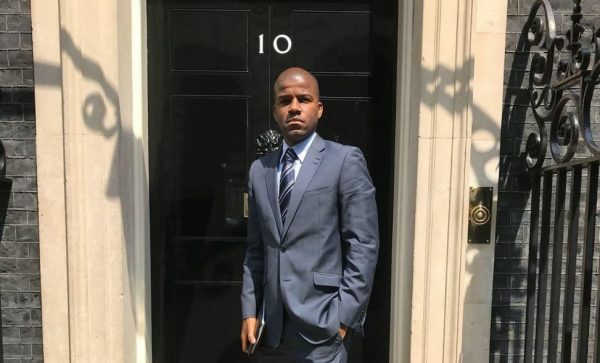 In a recent address to special advisors to British Prime Minister Theresa May, Director of the BVI London Office Benito Wheatley stopped just short of calling the UK Government weak-willed. He was referring to the Theresa May Government’s decision not to contest the public registers amendment to their Sanctions and Anti-Money Laundering Act when it was recalled before the UK parliament this month. He was speaking at meeting with representatives of the other Overseas Territories (OTs). “The UK Government gave in to political pressure and accepted an amendment to impose public registers on OTs, as opposed to allowing a vote by the numerous members of parliament who were against such a measure,” Wheatley said. The UK Government did not allow the aforementioned amendment to be put to a vote in UK parliament because they claimed they were ‘respecting the wishes of the majority of parliamentarians’. Wheatley told one of Prime Minister May’s special advisors that relations between the OTs and the UK have been impaired. He said, effectively, the move against the British OTs has ‘undermined’ their (OTs) self-governance and is a ‘clear demonstration of bias’. The BVI diplomat further said the UK is fully aware the BVI relies on financial services and tourism for survival. He further reminded the UK that those local sectors were ‘largely wiped out’ during the 2017 hurricane season. He then reminded the UK that while they have assisted Dominica with £14 million to rebuild following Hurricane Maria, help of that magnitude was not extended to the BVI to rebuild climate resilient infrastructure following those their disasters. The UK had, however, offered the BVI a £300 million loan guarantee to finance hurricane recovery. “The BVI government must take out commercial loans on the back of financial services in order to do so (rebuild the territory). Impeding our ability to secure such loans by undermining the financial services industry is not in the interest of the people of the BVI or the UK Government,” Wheatley said. “We are very disappointed with the UK decision,” he added. In the meantime, Wheatley expressed fresh concerns about the UK parliament legislating for the British OTs in areas where powers already have been handed over to the respective OT governments. One such area is the financial services, Wheatley said. According to the BVI’s London Office Director, the UK’s decision is a deviation from the policy set out in the 1999 UK White Paper known as the Partnership for Progress and Prosperity. That partnership agreement sought to modify relations between the UK and OTs from a colonial relationship to a modern partnership based on mutual respect and mutual responsibility. The Sanctions and Anti-Money Laundering Act 2018 received royal assent on May 24 by Her Majesty the Queen, which means OTs are required to adopt public registers of beneficial ownership by December 31, 2020.
Who did Mr Wheatley meet with – the No 10 cleaner? the time is right to comply rather than continually whine about this….the legislation has been passed by both houses and ratified by the Queen so just accept it even if you don’t like it. Stand tall BVI and lead by example rather than continually bleating on about how unfair it is because others haven’t been forced to adopt the anti money laundering legislation! – but they soon will. We should not be pushing to continue getting rich off dirty money – although I do wonder where it has all gone to? …..
Sam you again? You obviously have no clue about financial services and what we are fighting against here. Why should the BVI just ‘get on with it’ instead of it becoming a global standard which is all we are saying? It is unfair to put us in a position where businesses can flock to another jurisdiction, ironically the Crown Dependent Territories as it stands may well be in position to take all our business because of this. Is that fair? It’s only dirty money when black people benefit from it! Nobody questions the white billionaires about how they got their riches but as soon as we Caribbean folk start building big houses, owning businesses, driving nice cars, buying nice boats, sending our kids to college, owning supermarkets, commercial buildings etc. then it’s dirty money. So Sam, give me a few examples of ‘clean’ money? Sam has an agenda. He needs to man up and come public to debate this instead of hiding behind a computer screen. Thank God we are not foolish like the Sams of this world think. This “dirty money” theory again? Lead by example what – then America, England and all the others will follow? Who you trying to fool. Any child could see what’s going on here but this to shall pass. We need to stop bawling and playing the victim and get our sh*t together. Independence is NOT a viable or realistic option. We have to start thinking alternatives and prepare for what is coming. Stop being whimps and whiners people. We are better than that. Well said SMDH it really is so boring hearing from these whinging whining arm chair financial so called experts! Just face it the BVI must comply end of now grow up and stop bleating on about how unfair it is! We are better than that ….at least some of us are! Start planning and preparing for the future instead of treading water and throwing your dollies out of the pram…. Go wheatley go. Tell them. Move over esteemed. This man at # 10 has my vote. The day will never come where I take a taxi man’s (a bad one at that) opinion seriously! Stay in your lane from talking piss! Right! The UK has been notified that we will too when “soon”arrives. In every corner of the economic globe there are “good and bad money.” No country, none is free from illegalities, corruption, laundering and all else. The reality of this saga is, those countries that are making the most noise about “dirty money,” the UK, America and Europe has for centuries, up to present, have been involved in all aspects of money handling, legal, illegal, clean and dirty. So then, if the BVI is involved, who the hell you think they learnt it from? Santa Clause!?! Meanwhile, business is continuing as usual in those and all countries without any scrutinization. Hence, there is likely much truth to the statements of blogger SMH. Who determines what is good or bad money? Insurance companies for example conduct ‘legal’ business but their profits depend on covering minimum on claims, is that ‘good’ money just because it is ‘legal’? People like Sam the a$$ keep parroting the foolishness they hear in the UK and elsewhere but can’t back up anything they say with facts. A lot of the well known companies globally were built on the backs of slaves and slave labor and that’s why they are as big as powerful as they are today, is that ‘good’ money? Who’s to judge? The real problem here is that most people hate the fact that such a small island can enjoy such a high standard of living by offering the services that we do, that’s it in a nutshell. A company cannot hold dirty money, banks hold money. Where are the banks? City of London, Switzerland, USA. Go figure! Oh – wake up please….the UK is simply fed up to the back teeth of the BVI’s lack of transparency and apathy towards accountability – therefore they have forced it upon us – we don’t actually have a choice and must comply…but it’s of our own doing to be honest. Ok perhaps some companies will simply shift to secretive jurisdictions such as the US state of Delaware but fine we don’t want to get rich off dirty money! For too long overseas territories have been allowing “the corrupt to live in comfort” and it has now become a UK foreign policy issue. Unfortunately many of our leaders seem to have a similar desire to be secretive and nontransparent which is truly tragic…. Guys, the already have the info in BOSS. All they have to do is hit the “public” button. Hit the button for who to see? the queen, Theresa May or the media? I hope the cost is $300,000 per search for one register. That should substitute for the monies BVI will lose when the companies migrate to those countries which are rejoicing over this because they want what BVI has. The BVI government are corrupt as hell. They’ve been conning the people for decades, becoming filthy rich in the process by awarding ridiculously large contracts to themselves. Contracts for projects that become money pits for public funds, we know the ones, yet there is no explanation as to where all that money went. Perhaps the UK authorities have had a good look at how BVI government conduct themselves, it would explain their reluctance to reconsider. Better than buckling to corruption,nepotism and lack of financial transparency like the well named No Direction Party! Yeah BVI! stand up for your right. These British colonies have exploited us enough in the past! Let us ask ourselves(with exception of passage of hurricane Irma) what have they really done for us in the past? After reading some of these comments it is clear the BVI should focus on improving the quality of their education. If you don’t understand the world around you or how it works, let alone speak coherently about it, what good is protest and anguish?